It is clear that the capitalist crisis is not over. It has its origins in the problems of over-production and over-accumulation that arose initially in the 1930s. The problem was exacerbated in the 1970s with the implementation of neoliberal policies and the rise of financialisation, as ruling classes across the globe, including in South Africa, attempted to restore profit rates—something which has not happened. To shore up the agendas of these parties and politicians—and to try and win over sections of the working class—there has been an appeal to nationalisms based on exclusionary notions of race, religion and ethnicity in many parts of the world. In the U.S., France, Italy, and Britain there a rise in a form of white supremacist Christian nationalism and even neo-fascism. Immigrants from Africa, the Middle East and Latin America have been scapegoated as being the cause of the pressure and attack working and middle class people face as a result of the capitalist crisis and the actions of states—in the form of austerity to protect the interests and wealth of the ruling classes. This poses a major challenge for progressive politics, including in South Africa. The reason is, it avoids dealing with the root causes of the problems faced within society, namely class rule and capitalism. In fact, various nationalisms based on race and ethnicity have once again risen to prominence in South Africa. A white form a nationalism remains popular amongst large sections of white capitalist, middle, and working classes—and it was the basis around which apartheid was built. Using identity based on race and religion, a false cross-class alliance was built supposedly based on whiteness, and the legacy of this remains in place. Today remnants of this politics influence sections of the DA and groups such as Afriforum. This is stirring increased racial tensions in South Africa with potentially explosive consequences. It has, however, not just been right-wing parties and politicians that have imposed austerity but all parties that have been head of, or have come to head, states in this period of crisis. For example, despite claiming left credentials, when in power and under pressure from finance capital and EU institutions, Syriza in Greece has been imposing harsh austerity. In South Africa too, the ANC has capped the state’s national budget, it has reduced transfers to local government (where services are delivered) and has even proportionately reduced its spending on housing over the last few years. This despite undertaking its own populist actions like expanding free education to a degree, and under pressure from #FeesMustFall. Thus growing austerity on state spending on the working class is escalating, shifting the burden even more onto the shoulders of working class women in terms of the reproduction of the class. 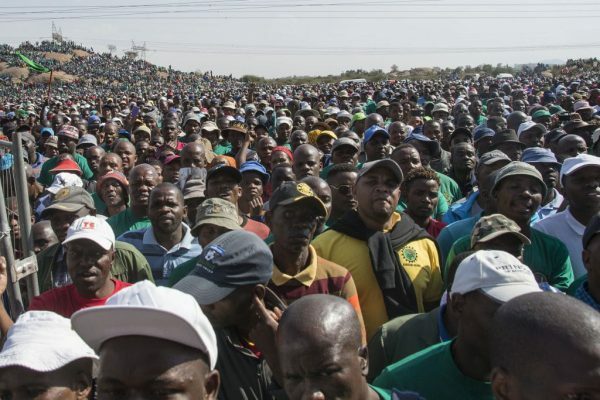 A huge crowd gathers to commemorate the Marikana massacre of August 16, 2012. Photo credit: Ihsaan Haffejee, “Mine workers remember the Marikana massacre,” GroundUp, August 17, 2017. Part of the reason for the arise of new or different forms of organising is because left parties and trade unions have proved to be largely ineffective in resisting neoliberalism, let alone new challenges such as the rise of extreme right wing nationalisms and even neo-fascism. But these experiments with new or different forms of organising have largely not been sustained. The mass assemblies and protest movement, which was the Arab Spring for example, was crushed by a counter-revolution throughout the Middle East. In South Africa, in the face of the labour law and state repression, the workers at struggles—such as Marikana—drifted back into a union, AMCU, despite it being as equally bad as NUM. Shawn Hattingh is a researcher and educator at the International Labour Research and Information Group.